Retail Revolution - How to get physical in a digital age. Retail Revolution – How to get physical in a digital age, Frame 115, Frame Publishers, Netherlands, March/April 2017. Inner Space, Au Pont Rouge, Saint Petersburg, Azure Magazine, Azure Publishing, Toronto, Canada, November / December 2016. Cheungvogl has created an open exhibition retail space around a robotic system within the restoration of the 110 year old iconic department store, Au Pont Rouge in Saint Petersburg, Russia. Completed in 1907, Au Pont Rouge located along the Red Bridge on River Moika was built in the tradition of great European department stores such as Galeries Lafayette in Paris or Selfridges in London. Following the revolution in 1919, the building was renamed and converted into Volodarsky Sewing Factory and in the 1930s, the original cupola was demolished. 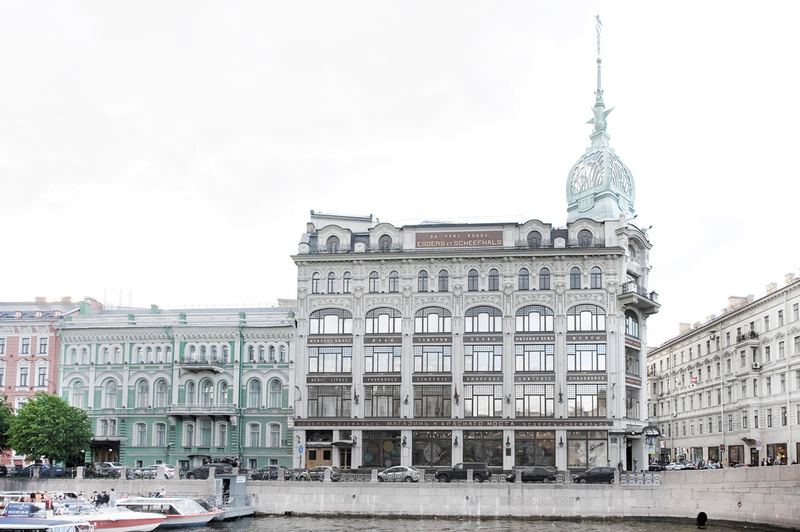 In 2011, the cupola was reconstructed and the building underwent functional and architectural transformations to restore Au Pont Rouge to its original state as a world class department store in Saint Petersburg. The building originally designed by Konstantin de Rochefort and V.A. Lipskii in 1906 was engineered with steel frames encased in concrete structure. The building’s distinctive cupola, central atrium and art nouveau staircase connects eight levels of the building. Historically, department stores introduced not only the early modern retail model, but also had a strong influence on the social and urban network of the cities and societies, acting as a catalyst for social exchange and redefining the role of consumerism. Within the renovation of the historical structure, Cheungvogl recreates the past innovation of Au Pont Rouge by transforming the new Multi-space into a truly public space of social, cultural and economic meaning to the city of Saint Petersburg. The origins of the department store lay in the accelerated economy expansion and growing affluent middle-class with the Second Industrial Revolution in the late 19th century. At the turn of the 20th century, transformations brought by digital revolution (Third Industrial Revolution) and changes in consumption behaviour and social habits challenges the meaning and existence of department stores. The global shift towards online shopping and the reshape of consumerism has rendered many classical department stores and the retail model obsolete. On the brink of the current Fourth Industrial Revolution, which interlinks information technologies with automated processes in all aspects of life, there is an immediate need to rethink the core values of the future retail model. The robotic system (left) adjacent to the historical atrium anchors the function of the building. The robotic system (back) adjacent to the historical atrium operates as the backdrop of the building. The robotic system (right) operates at a speed of 5 meter per second per robot arm. In Au Pont Rouge, Cheungvogl creates a precedence to implement a robotic system to choreograph new experiences that encompasses historical, architectural, technological and cultural values for visitors to enjoy spending time, interacting and exploring in the store. The physical shopping experience is tailored for visitors’ entertainment with hands-free comfort and efficiency that the automated system offers. The exhibition space is freed from all trading operations and stocks, unfolding the potentials of creating a retail environment with enhanced spatial qualities and surprising experiences with alternative uses of space. The central atrium connects the eight levels of the building with natural light. The robotic system (left) adjacent to the historical atrium. The robotic system in operation. This robotic system silently conducts all operational and logistical aspects in the background. Resourcing a mobile application to scan items to be added to the virtual basket and upon purchase, the robotic system proceeds the order to the point of sale or prepares the delivery to alternative locations. The classical trading process between patrons and sales is replaced by informative consultation with strong focus on human interactions and intellectual exchange, setting new standards for services. The speed of the machine along with the open exhibition retail provides simultaneous fast, slow and very slow pace shopping experience. The check-out bar serves exclusive beverages from around the world with consultants offering bespoke consultancy specific for each customer. While the external envelope of Au Pont Rouge is restored to its original state in accordance with local regulations, the sensitive internal upgrades of the historic icon is designed to enable the transformation of the department store into a new centrepiece for commercial, social and cultural life. The store is designed in a museum format. The design respects the integrity of the architecture as a symbol of progressive culture. It aims to interweave a subtle yet dynamic hybrid between the architecture and its context. Heavily damaged structural parts, the distinctive art-nouveau staircase, balustrades and windows are restored and repaired to its historical conditions. Original non-structural elements were destroyed or removed over the last century of factory use and abandonment. 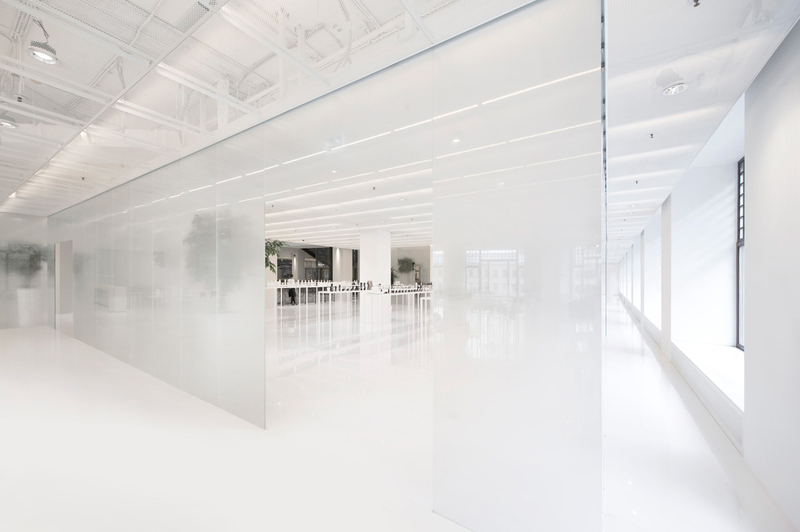 The translucent glazed panels pass by the facades without anchoring to the existing, creating a 100 meter long gallery between the building façade and the interiors. The salon in its traditional sense, forms social gathering space that engages visitors to converse, redefine taste and spend time. Stretching along the peripheral of the building, the salons filter daylight and city views across to the central atrium and connect the eight levels of the building with natural light. Every space is tailored for its specific dimensions and how it exists and co-exists within the larger context. The new insertion is reduced to a sequence of translucent layers, organised and built upon the appreciation of the authentic craftsmanship so that the two can coexist to envision a new kind of connectivity between the urban fabric, architecture and people. Materials used are pure and light, both in their physical substance and poetic representations. 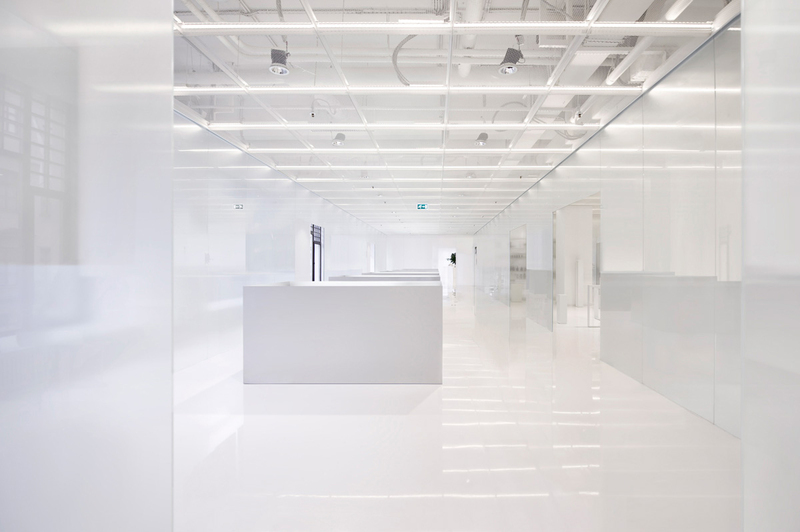 The light industrial flooring and veil-like expanded metal ceiling reveals the support systems of the restored structural elements and newly integrated mechanical functions. Fixtures are simplistic in their aesthetics but highly technical in their detailing and manufacturing process. Layered interconnected rooms defined by luminous interceptions allow spaces to flow into one another. The simultaneous visual connections and engagement between rooms and passages change the perception of space to inspire curiosity to learn, observe, touch, and enquire through poetic senses. The store is designed to encompass multi-faceted spatial experience, from shopping to social and cultural gatherings, enhanced by designated sound palettes specific to each level. The curation goes beyond the notion of selecting unique products from around the world. Each space is dedicated to express the origins of where and how products were founded and engineered. Expressing stories behind the brands reflect the high culture that amalgamates art and science. The curated spaces, designed to exhibit niche objects in a museum format supported by the robotic system provide opportunities for the visitors to interact, explore and experiment presents a renewed approach to consumption. The design creates and unprecedented niche retail experience that customers want to spend time exploring extraordinary objects and stories from around the world. Paring down to the essentials of story-telling allow people to participate, forming their knowledge about the objects and partake within the process of making. Interconnected rooms are defined by different degrees of translucencies to allow spaces to flow into one another. Through promoting thinking, communication and interaction between people and objects, the environments transform into a place for inspiration and education. With the provision of space as the new luxury, the holistic interpretation of the future retail model rebrands Au Pont Rouge as an innovative one-of-a-kind department store, which distinctively connects the architecture and its programming as a transformer of public life. The spa and treatment areas continue the simple materiality of the Au Pont Rouge Galleries, utilizing translucent glass, white resin and metal meshed ceiling. Translucent fixed and sliding panels are used to define openness and privacy between the scenic city views overlooking Moika River and the centre of the restored historical structure. Between the city life and the variety of offers and activities in Au Pont Rouge, the spa becomes a retreat from the fast pace - a slow space in between. Inside the tranquillity, the changing daylight becomes the only indicator of time. To engage with the public and customers, the treatment facilities are designed to house a variety of events, such as screenings, workshops, presentations and talks. Inside the spa and treatment areas, one room is dedicated to self-reflection and the art of selfies. The “Selfie Room”, a testing and sample room, creates a stage for visitors to feel like performers, models and directors of the self-image at the same time. 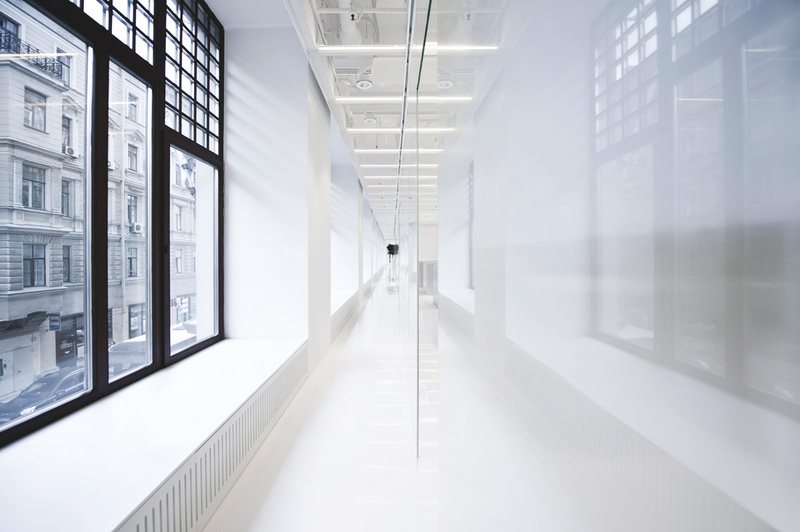 The space features a long mirror wall, reflecting in the background is a curved mesh that filters indirect lighting. The light is designed to illuminate the faces perfectly without shadows. Upon entry, visitor experiences a light tunnel with continuous reflections. Animating the self-reflection within the abstract context, one is driven and inspired to act, document and ultimately share the moment. 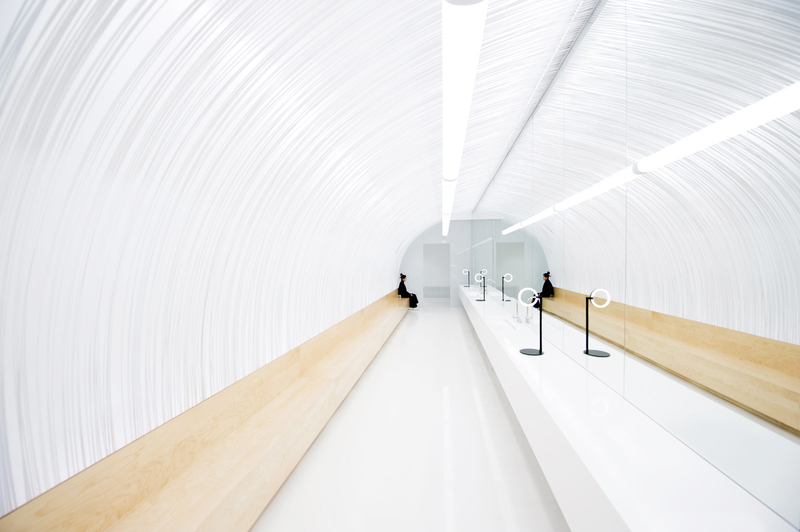 The space merges the online and offline experience of visitors and brands. By sharing the self-image through social media, visitors create 15-minute fame for themselves and advertisement space for the brand within their social networks. In the shared posts, the brand itself is only apparent in the Geotag. The ‘Selfie Room’ is a physical social media advertising space and a creative playground for self-reflection. The flexible and multi-functional Multi-space invites the public to engage in unexpected programs and events such as workshops, fashion shows, screenings, lectures, exhibitions and art performances, transforming Au Pont Rouge from a niche retail environment into an interactive social and cultural destination beyond its historical meaning to Saint Petersburg.